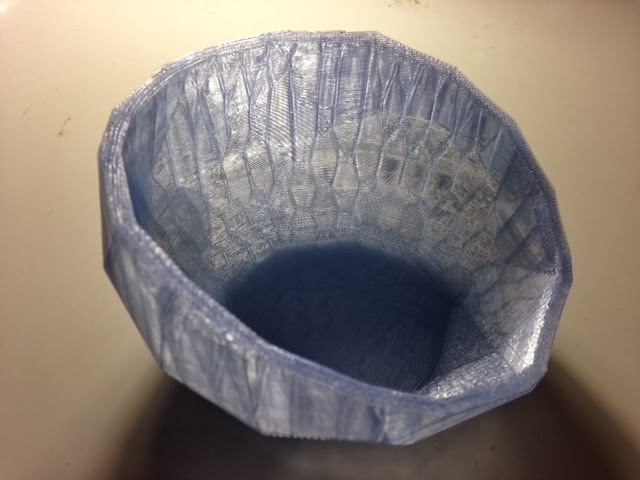 Today we print a beautiful low-res bowl made from gelstudios' wonderful Customizable Bowl Factory on Thingiverse. Settings: MakerWare "low" at 70% of the size in the file, with supports on because the bottom of the bowl has a lip around the edge. The print took just over two hours. Stuff to change: I wish I had used the linear fill, since the hexagon fill pattern interferes with the visibility of the large faces of the low-res design. Or maybe this is a model best done in an opaque filament?